You may have one of the most helpful items or benefits to offer on the market that brings a large group of people to you! However, your ability to hold, convert and retain your customers depends on how promptly you track the right matrices to optimize your conversion rate! One of the core methods of doing it is understanding user behavior first! Your users speak in a behavioral language rather than verbal. 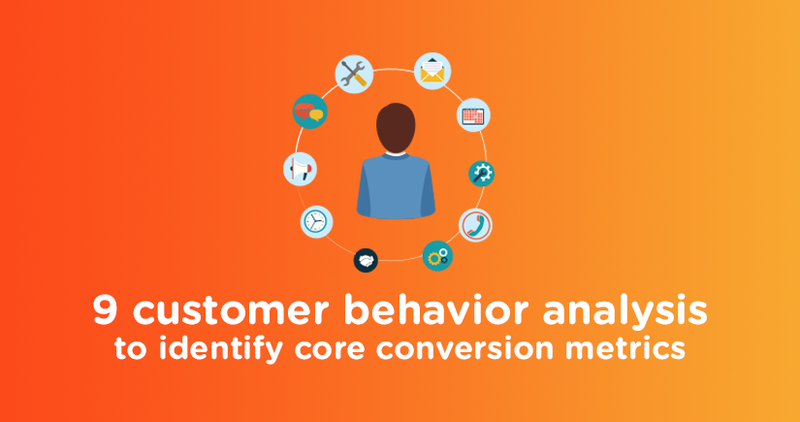 So it’s crucial that you understand how to analyze their behavior to identify the most effective and core conversion metrics! 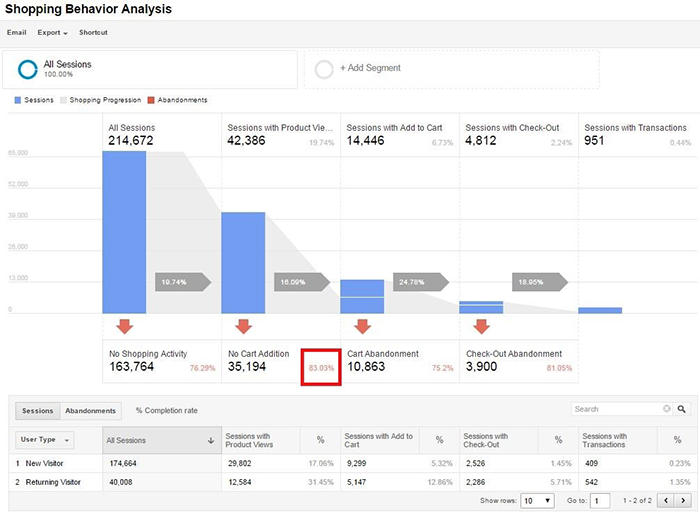 In this post, I have extracted 9 actionable customer behavior analysis by which you can identify the core conversion metrics and customize them to boost conversion. Let me get this straight first, we are not discussing SEO here! But sourcing traffic which is a part of SEO is also a significant part of customer behavior analysis for conversion growth. So what type of CBA (customer behavior analysis) you do while generating traffic that impacts your core conversion metrics? 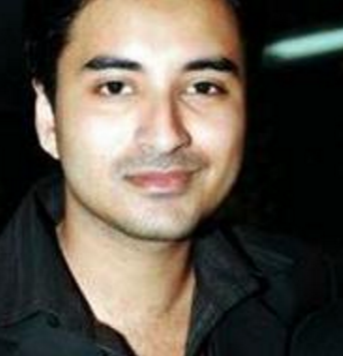 There are couple of them such as demographic, age, interest analysis and many more. This is important because your product or service must be for a certain location to a specific group of people with a definite interest. So when you are generating traffic, make sure you have a “targeted visitor checklist” that will be cross checked against all the sources you are generating traffic from. Under Source/Medium you can see the sources from where visitors are coming. From 1 to 10 every sources is generating more or less conversion which means there are targeted users there. However, the 6th source is not generating any conversion even though it’s got a good amount of visitors. So how do you make a risk free anticipation? First, identify the key conversion funnels such as, product view, cart addition, checkout and purchase. Then track from which funnel visitors are dropping off! Compare them with the other funnels having higher conversion and track the loophole! Remember, when visitors are exiting rather than bouncing its means you failed to fulfill their needs! The funnels having higher drop offs are most probably failing to express the quality of your product, lacking in information, design, visual appearance, navigation and many more! Here you can see there is a high percentage of visitors who were active on the site but did not add the products on the cart. This indicates something is wrong in your product page, details or promotions! When you compare this particular drop off funnel against a high converting funnel you can track the lacking’s easily and create a checklist of how to improve! This particular customer behavior analysis has been a result driven step for higher conversion matrix. A bounce rate is the percentage of the total number of visitors who landed on your web page and left immediately! This means no navigation, no click through, just instant closure of your URL. An exit rate is the percentage of the total visitors who navigated your website page by page, had click through and performed certain actions but eventually did not convert and left your site! For example, visitors navigating from your home page to your sign up form or shopping cart but did not finish it and left your site! We often make a terrible mistake by mixing these two customer behavior analysis which ultimately leads towards wrong data analysis. Check the highlighted areas on this image. You can see the bounce rate>Exit rate! This means that something is wrong on this particular page with possible reasons like cluttered page design, unclear CTA, confusing navigation and unnecessary page elements. So if you find your users are having this kind of bounce and exit ratio, you should have your designers and SMM guys look in to it. Both the visitor source and visitors page experience needs to be checked. The findings could be jaw dropping and may need a complete reshuffle. But this is crucial for higher conversion and it’s also considered as an effective conversion metrics. Affinity analysis is the technique by which you find out connections between your product/service or offers and visitors. It is about specifying a group of people who are visiting your website the most and are likely have higher potential to become a customer. For example, you are selling “email marketing services” or “marketing automation tools”! By affinity analysis you can first track the “type” of people visiting your site the most. The type could be technophiles, avid readers and business professionals and so on. 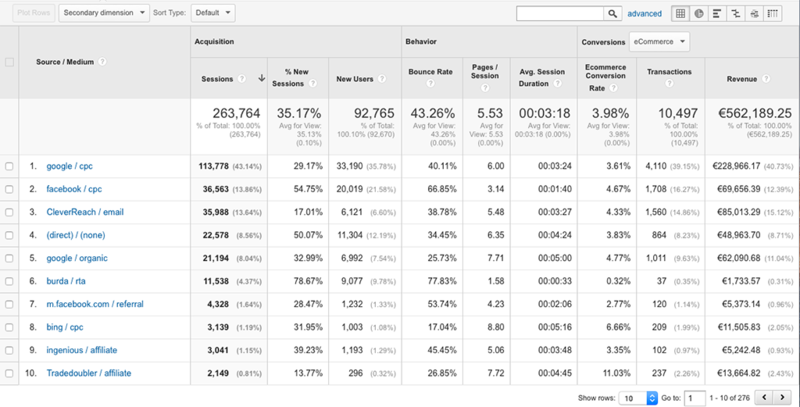 You can separate the categories by the number of visitors, visit frequency and the percentage of page sessions. This will help you to have an impactful idea on the interest of these groups and then you can fast forward your promotion centralizing these group of people. Note the red highlighted areas in the image. These are the affinity users on a website who are already in the purchase funnel and has started the process of conversion. You can see at the top there are Technophiles who are on your site at the most numbers. So if you are selling technology related stuffs this is a good sign! On the other hand, you can see “News Junkies & Avid Readers” are at the bottom. So if you are drawing traffic from any sources where the readers are more engaged than technophiles you may consider changing that. After all, time is money! It’s practical to spend your time one sources where you get targeted traffic rather than lots of unnecessary visitors who would drop off in seconds. This is one of the most effective and core conversion metrics which leads towards higher sales volume. Another customer behavior analysis that leads towards and increased sales volume. This analysis reveals the number of visitors coming to your website who are in your market and either searching, researching or trying to buy the product or service you are offering! How do you identify this? Let’s focus the top and bottom ones here! At the top highlighted area you can see the highest number of visitors are from business service, advertising and marketing industry. At the bottom you can see educational sectors visitors. From there, you can “Target” “Filter” and “Pursue” those specific industry professionals to increase your engagement, build repo, create social relation and promote your contents. This eventually will result in increased number of targeted traffic that will impact on your conversion. Note the categories 1, 2 and 3 first (Highlighted in red). From all these categories you have highest number of users. But the bounce rate is above 80% which means only less than 20% people navigated the website for an average of 1.03 minutes only! This means almost all the users found the website irrelevant to their search and clicked your link through intuitive interest. This is not happening because you are lacking something in your page. It’s because you are getting the right users from the wrong places! Users are never wrong but the approach to invite them could be! In this example, the common thing amongst the drop off categories are “arts and entertainment”! This means people with this interest are not interested in your offer. You just managed them to visit you for once through your SMM efforts! On the other hand, note the categories 3, 4 and 7! You can see lower but a healthy number of users having an average session of 1.33 minutes! This is not too high but significant enough to plan your conversion. You can do data mining to find out more places like these categories to bookmark, promote, and share your offers! So instead of focusing on the red highlighted areas, if you put more efforts on the green highlighted areas your conversion will grow higher. Here you can see there are 8 pages listed showing different data from user end. Now how this data will help you to identify a conversion metric? “Most exit rate pages” lets you know the exit point of your visitors, from which page your visitors are leaving before conversion. The findings will let you fix the user drop offs, higher bounce rate and higher exit rate. These 3 comparison are surprisingly useful conversion metrics that actually brings results. This is a very effective customer behavior analysis by which you track how many of your contents are being viewed by a single user or a group of your users on a single visit. You can segment the most viewed pages and least viewed pages for a face to face comparison. This is helpful to identify weak aspects of your least viewed pages and reshuffle them according to the mapping of your most viewed pages. Here you can see the page per session is 1.72 only! This means barley 2 pages are being browsed by visitors on a single visit. This is a low number for conversion. So you can track the pages viewed least and improve them to get more visits. Increased page per visit is one of the core conversion metrics for almost every kind of website. It helps to boost the CTR as well and is impactful for ranking. Your visitors may come in by mobile devices or directly from a computer device such as laptop or desktop. You need to identify from which device your visitors are mostly dropping off, exiting and converting. This is a popular customer behavior analysis while doing conversion optimization. Here you can see the highest number of visits by device is from desktop. The other devices such as mobile and tablet are also having good numbers. But if you noticed, both the devices mobile and tablet has less than 50% visits comparing with desktop. So you must check the CTR and PPV from the other two devices. Afterwards, you have to check the conversion from each of this devices. Even if the visits are lowers doesn’t mean the conversion would be lower. 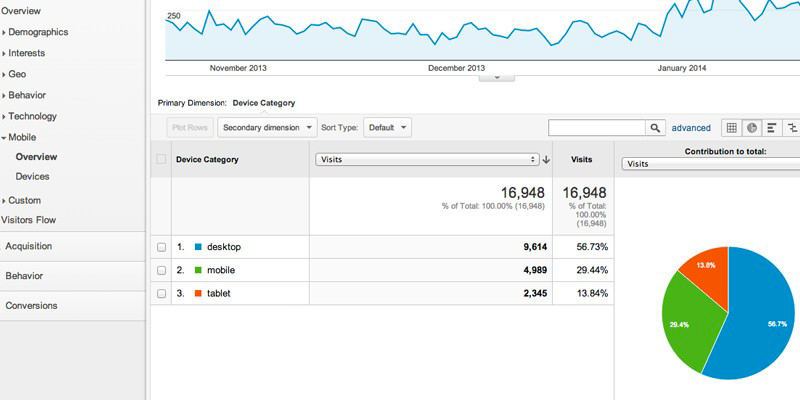 This metric can be used only to check how the visitors are performing on different devices. You will be able to identify the devices generating lower conversion and check WHY? Page visibility, page load time, page scripting, page navigation and many other UX related issues may appear as the cause. All you got to do is fix them and take precautions for feature. Remember, when you are eyeing towards boosting your conversion you will have plenty of issues. Many things may appear as wrong and unnecessary. Though, this is good because it allows you to learn your mistakes. Mistakes are bound to happen and correcting them is the main thing we can do. So there you have it. These are more or less the most relevant customer behavior analysis which lets you determine core conversion metrics for your site. I have used Google Analytic to exemplify the points. If you are using a different analytic, the approach will be the same. So feel free to add your thoughts and findings in the comment box.